2014 Virginia IGEM took various measures to ensure safety in the lab. Proper training and safe handling means reduced risk of contamination for the user and the environment, and ensures reliability of experimental procedures. Working with biosafety level 2 organisms: The Nylon Hydrolase biobrick was made over the course of the fall. The gene comes from BBa_K1357007- a flavobacterium plasmid. Hence, this falls under the biosafety level 2 category. 3 lab members were allowed to work in constructing the Nylon Hydrolase construct. These lab members had undergone the BSL 2 safety training before working in nylon hydrolase. A UV illuminator was used for viewing bands in agarose gels. UV rays are also a minor source of potential danger as high rates of radiation are carcinogenic. Lab members working with UV illuminators wore face shields, lab coats, and gloves at all times in order to prevent any exposure to UV light. Also, it was emphasized not to leave the UV board on longer than necessary. RNA safety: A designated area was specified for use with RNA. This space was sprayed with RNAse away before use. Any lab work involving RNA was conducted with a set of barriers tips and pipettes that were only used for RNA. Solid waste: Any solid waste that might have come in contact with our bacterial cultures was stored in an autoclavable bag. This waste included: pipette tips, petri dishes, falcon tubes, Eppendorf tubes, pasteur pipette tips, 96-well plates with lids, and spin columns with collection tubes. This bag was autoclaved and sealed before being discarded as waste. 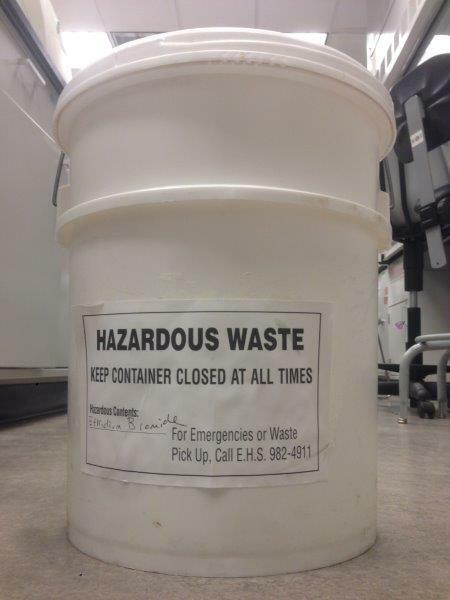 Liquid waste: All liquid waste was collected in a vacuum Erlenmeyer flask. This included various bacteria cultures. The Erlenmeyer had bleach added to it. 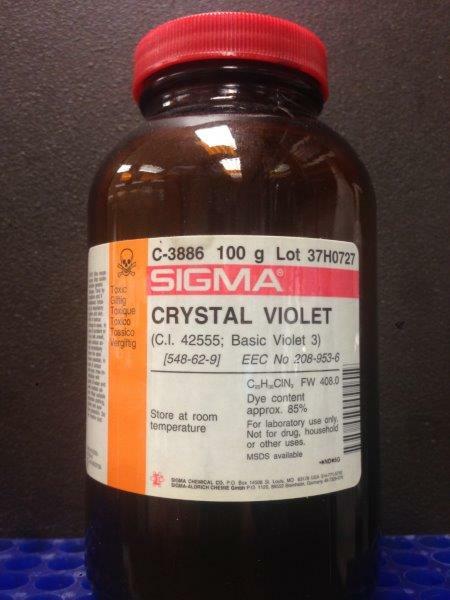 Crystal violet dye was used in the crystal violet assay for biofilm staining. Several steps were taken in order to prevent contact of crystal violet with the user, and to ensure proper disposal into the environment. (You should have a separate picture here at the side with a crystal violet label. A designated area was allocated specifically for the use of crystal violet. During the use of crystal violet, it was ensured that lab coats, gloves, and googles were worn in order to prevent any skin contact. The crystal violet solution was collected in a vacuum Erlenmeyer flask during the assay (reference here). This solution had bleach added to it. At the end of the assay, the solution was placed in a 2 gallon bottle and was handed over to the environmental health and safety (EHS) personnel for proper disposal. ETBR had been used throughout the summer in agarose gel electrophoresis. 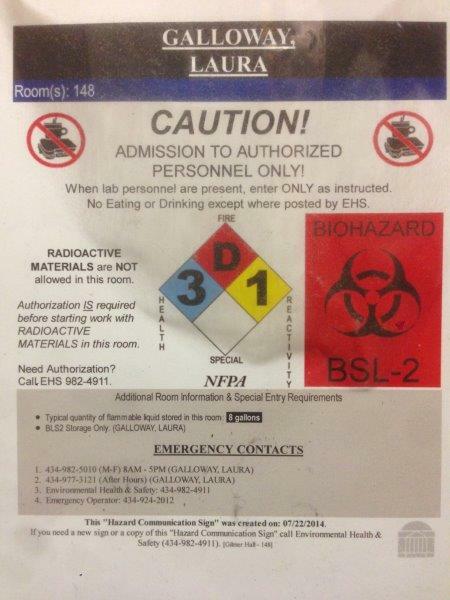 ETBR is a mutagen and a carcinogen, and needs to be handled with care. All ETBR handling was done under a sterile fume hood. Anything that came into contact with ETBR was kept in a container which was used exclusively for ETBR waste. This waste included pipette tips, used agarose gels, and gloves. This waste was later was handed over to the environmental health and safety (EHS) personnel for proper disposal.